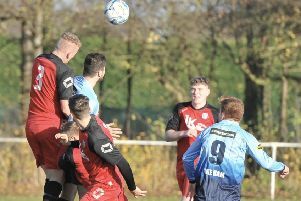 Market Rasen Town got back to winning ways with a solid win over Marsh Rovers on Saturday. A week on from their defeat to leaders GB Kitchens, Andrew Belt’s double earned Town a 2-0 win at Rase Park in a match between two sides who kicked off the day locked on the same points. Rasen’s fifth win of their East Lincs Combination campaign moves them up to fourth place in Division Three, but eight points off top spot. Victory this Saturday will lift them into the top three as they head to Louth Old Boys Vets who sit a place and a point above Town. Kick-off is 2pm.